Front Wheel Travel 130 mm / 5.1"
Rear Wheel Travel 120 mm / 4.7"
The 2010 Boulevard M109R Limited Edition represents a welcome addition for those hooked on the M109R's muscular powerplant and awesome performance, but seeking something more distinctive in style and appearance. The Limited Edition M109R is dressed in a standout white colour scheme with a blue centre stripe. Other details include the Boulevard logo which is embossed into the rider seat and a checkerboard instrument gauge package. 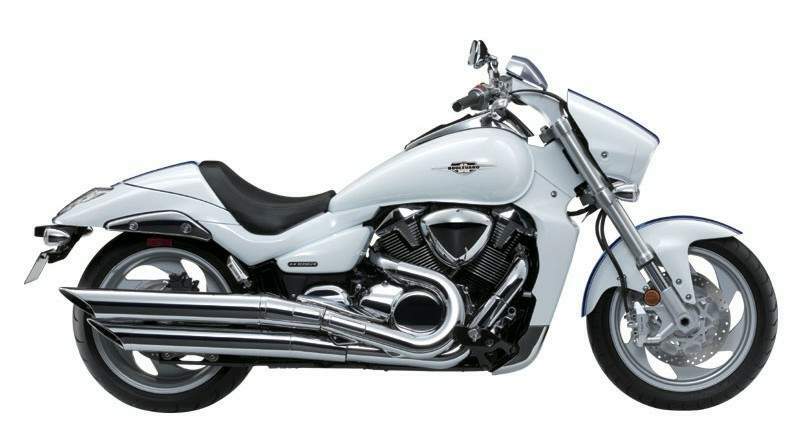 The Boulevard M109R is the most powerful cruiser Suzuki has ever produced. The all-new liquid-cooled 1,783cc engine featuring four valves per cylinder and SDTV digital fuel injection gives you all the power you need, when you need it. The Boulevard means business in every way. Call it the best of all worlds. 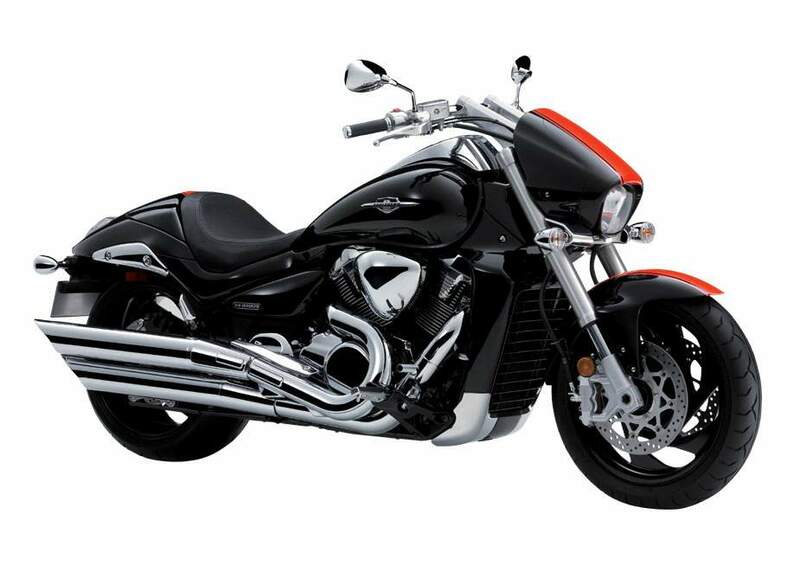 Suzuki's award winning Boulevard M109R - an incredible combination of cruiser styling and renowned Suzuki power and handling. By injecting the Boulevard M109R with a potent shot of race-proven technology developed for the championship-winning GSX-R sport bikes, Suzuki has literally redefined the concept of a cruiser. The Boulevard M109R's exhilarating performance begins with its 109-cubic-inch, fuel injected V-twin engine. 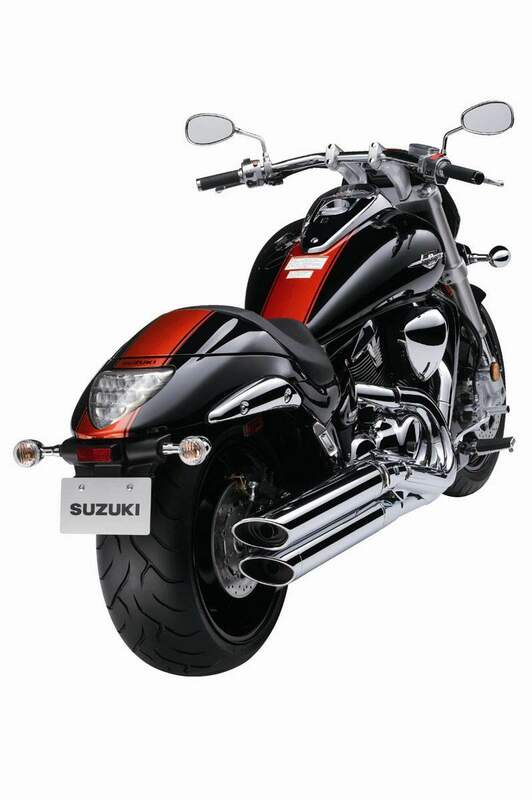 Like Suzuki's sport bikes, the Boulevard M109R balances extraordinary performance with crisp handling, thanks to a technically advanced chassis and suspension, matched by world-class brakes. And when it comes to wrapping that performance package in cruiser styling, a picture is worth a thousand words. Check out its sleek, flowing lines and GSX-R inspired styling touches along with a hot white with blue racing stripe paint scheme and you'll realize that the Boulevard M109RZ is in a class of its own. - Aggressive new special edition M109R with a sporty racing stripe, checkerboard background gauge package, clear taillight lens with red LEDs and a stylish textured seat. - Limited white colour scheme with a blue centre stripe. - Boulevard logo on seat surface. - Clear lenses on brake light and turn signals. - 1,783cc, liquid-cooled, DOHC, V-Twin engine is designed to produce a massive tractable power and responsive torque. - Huge 112mm forged aluminum-alloy pistons. These are one of the largest reciprocating gasoline engine pistons being used in any production passenger car or motorcycle, while featuring race-proven design to reduce friction and inertial mass. - Suzuki Dual Throttle Valve (SDTV) fuel injection system produces smooth throttle response even at low engine rpm. - Suzuki Advanced Sump System (SASS), a compact dry-sump lubrication system, designed for reduced engine height, a lower crankshaft position and lower center of gravity. - The race-proven brake system came straight off the sportbike, including radial-mount opposed-4-piston front brake calipers and a dual-piston rear brake caliper. - Inverted front forks featuring race-proven cartridge internals with 46mm stanchion tubes. - Cast aluminum-alloy swingarm works with a progressive linkage and a single rear shock absorber; adjustable spring preload to suit rider and passenger weight. - The widest, massive 240mm rear tyre, ever used on a Suzuki motorcycle. - A sporty solo-seat cover that can be quickly swapped for the included passenger seat. 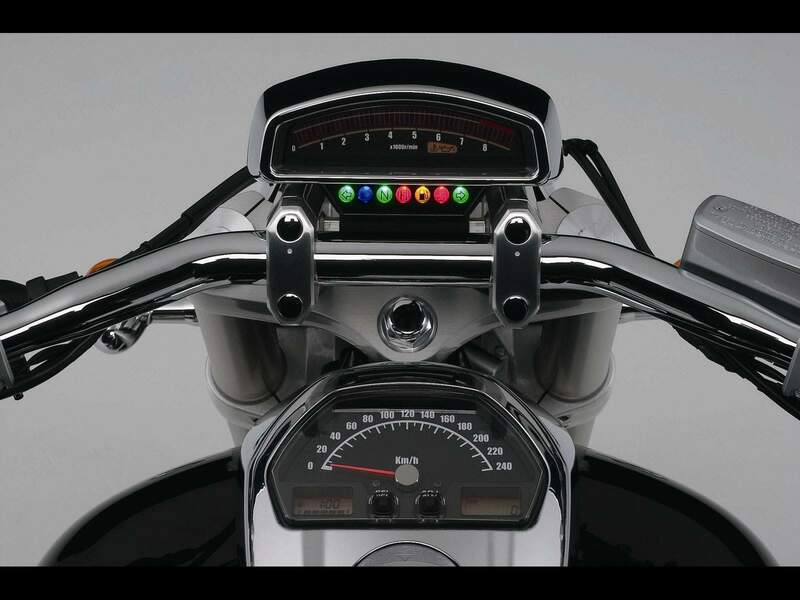 - Handlebar-mounted instrument cluster, including a digital tachometer and LED indicator lights. - Tank-mounted analogue speedometer and LCD odometer, dual tripmeters, fuel gauge and clock. A sleek wide fuel tank with 19.5 L (4.3 Imp gal) fuel capacity that flows into integrated side covers, a comfortable low seat and stylish radiator cowl.